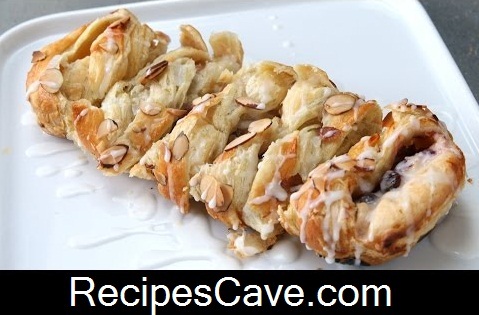 Cranberry Cream Cheese Braid Recipe follow these simple steps to make your tasty recipes. In a microwave-safe bowl, microwave orange juice for 30 seconds until warm. Add cranberries to juice and let it soak for 10 minutes. In a medium bowl, combine cream cheese, sugar, and vanilla extract. Mix until smooth. Unfold puff pastry, and 1 inch from the top, fill the middle row with cream cheese mixture. Leave one inch at the bottom. With a knife, carefully slice diagonal strips on both sides, leaving 1 inch from the top and bottom. Cut off the top and bottom excess pieces. Fold the top inch dough onto the filling, then lay the dough in a criss-cross pattern to form the braid. Before the last couple strips, fold up the bottom and lay the remaining strips over. Whisk an egg and brush it over the top of the braid. Add almonds or other nuts. Cut into desired size and drizzle the icing and enjoy. Your Cranberry Cream Cheese Braid Recipe is ready to enjoy.